My first reaction on hearing Mark Turner was gratitude. Here was someone on intimate terms with music. I heard someone who had assimilated a wealth of information, but was already looking inward to express himself. There was nothing strident about his playing. He possessed an enviable equanimity regarding improvisation, allowing the ideas to take shape on their own. These kinds of musical assets probably have to do with a basic, unchanging faith that Mark has in the creative process itself, and they were in place when I first heard him, in 1992. What is it that gives a musician his or her personal “style”? Often, it’s the rhythmic and melodic qualities that draw us in: phrases that stagger “behind the beat”, an inspired improvisation we say “could have been a whole new song.” Less talked about, perhaps because the terminology becomes more specialized, is the specific harmonic imprint a player can leave. The twelve-tone scale is always compelling to us. It’s a timeless set of elements containing the potential for infinite variants. What a musician keeps and throws away within all that is what gives him a subjective voice - a calling card of sentiment. Melody, because of its monophonic simplicity, is perceived on an objective level - a “good” melody is gauged on its universality. But when these tones mix together, the experience becomes fragmented as each listener finds empathy with the harmonic implications of a particular body of work. When we are “moved” in this way, it is on a deep, inner-level. So it was Mark Turner the harmonist that moved me initially, and still does. His own compositions communicate this most immediately. Take the opening track, “Mesa.” Over a pedal point of B we hear the saxophonist and piano play the melody in unison, out of time, coyly giving the impression of mystery. This beginning only appears artless. Three tonal centers are spelled out - B, E flat and G, respectively. Functioning less as melody, these parallel note-groups serve as a harmonic blueprint for the rest of the tune. The relationship between three tonal areas a major third apart from each other, and the crunchy impressionism of the major third and fourth of each row grinding together, are exploited, and the result is a harmonic landscape throughout this “Mesa” that is very much Mark: opting for mediant relationships instead of dominant-tonic, and casting a mixolydian blur on the dominant seventh chord with the added fourth, he conjures a world of half-lights and shadows, filled with achy, suffused longing. 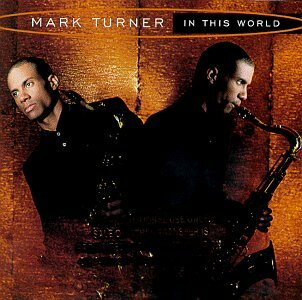 Whether it’s the up-tempo treatment of Mancini’s “Days of Wine and Roses,” or a reading of Duke Pearson’s beautiful ballad, “You Know I Care,” Mark Turner’s sound on the horn is unmistakable: warm, capable of profound gentleness, never saccharine, it’s a recipe for seduction. He uses his technical command of the altissimo register as a means to an expressive end. In these upper limits of the tenor saxophone, he often plays with an easy affability, not distorted or harsh. This juxtaposition of extremity and grace conveys an alluring kind of emotional baldness. Mark’s output involves very little affectation. He doesn’t court the theatrics often associated with his instrument. Disarming in its sincerity, there is a unique lack of need to represent irony or unexpectedness in his playing. Musicians in our age group (myself included) frequently employ these sentiments to add flux to the plot of their musical storytelling. Mark seems to have already moved beyond this in many ways, playing with a direct candor usually reserved for older players. To close on a different note, a little about Mark Turner, the person: it’s been my observation that this graceful straight-forwardness is something Mark carries into affairs outside of music. Comforting, that.